Terri Wangard: Why Did Germany Allow Hitler? Why Did Germany Allow Hitler? How could a civilized country like Germany allow Hitler and the Nazis to wreak havoc on the world? Life in the Third Reich by Paul Roland explores reasons why. A lack of civil courage was as much to blame for Hitler’s rise as uncritical adoration by his supporters. The Nazis came to power using lies and dishonest means. They had suffered serious reverses in the 1932 Reichstag elections. If industrialists and bankers had withdrawn their support, the Nazis may have imploded. Instead, their sustained election campaigns gave the illusion that they were popular, strong, and well-funded. Many Germans lacked enthusiasm for Hitler, but hoped for an end to the economic chaos and violence between rival political parties since their defeat in World War I. Life wasn’t easy. Many apartment blocks were unheated. Hot water bottles were taken to bed, and in the morning, the lukewarm water was used for washing. Communal bathrooms were common, with no toilet paper. Clothes were washed with a washboard and bristle brush once a month. Once Hitler persuaded the elderly President Hindenburg to appoint him chancellor, the Nazis immediately clamped down on universities, Catholics, and government offices, disbanded trade unions, began indoctrinating children to turn them against their parents, and supplanting religion with neo-pagan worship, deifying Hitler. They burned books because they feared anything that encouraged people to think for themselves and question what was happening. Ballot papers on the national referendum on reoccupation of the Rhineland were numbered with invisible ink. Those who voted against reoccupation were arrested. 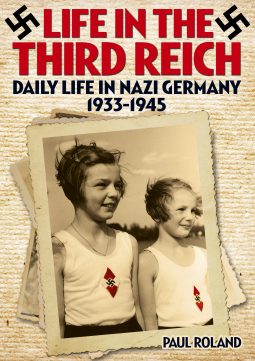 Life in the Third Reich focuses on those who were children in the 30s and 40s. All emphasized how they could trust no one with their anti-Nazi sentiments, at the risk of being reported and arrested. Support for the Nazis ebbed as the Allied bombing intensified. By then, the German people had lost all their freedom. Paul Roland reveals the stark contrast between the myth of “One People, One Fuhrer” perpetuated by Nazi propaganda and the harsh realities of life in a dictatorship. It challenges the popular view of Nazi Germany as a nation united behind Hitler. What would you have done? Would you have behaved any differently if you had lived in Hitler's Germany? "subvert young people’s traditional religious upbringing, destroy moral sensibilities and civilized behavior" Sounds pretty familiar in some ways to what is happening in our country with what young people are taught about gay weddings, etc. Pretty scary stuff. Not too many people are speaking out about it now either. How does that go: if you don't learn from history, you repeat it? Reminds me of religious cults as well. Anyone who requires absolute loyalty and is threatened when people think for themselves is someone to be wary of. That goes as well for the anti-religious. People who demand freedom from religion try to muzzle religious talk, accusing them of being close-minded.